Onam celebrations 2009, held on 5th September 2009 was a huge success. A sumptuos Ona sadya, Maveli and delicious programs and a record crowd. On that occassion the office bearers of 2009-10 were also announced. Please join us in wishing this all women crew success. Ona Madhurima – a group song written, composed and sung by community talents including professionals. Newly elected Officials for 2009-10 will be introduced during the short business meeting. For timing and details of the event, please click here. Take part in this Onam festivities and make this year’s Onam a memorable one. Wish everyone a Happy Onam! Onam, a celebration unique to Kerala where unity had always coexisted with diversity, especially during festivals, when people come together to celebrate life’s unlimited joys. In this years NEMA’s Onam festivities, we blend traditional celebrations with a showcase of our rich cultural programs. Pookalam, Ona Sadhya etc are definite to evoke fond memories and nostalgia. A wide variety of programs are getting ready in the backgr0und. Singer Thahaseen would be performing for the Onam show. Looking forward to meeting everyone for Onam. Please click here to view the Onagosham 2008 album. 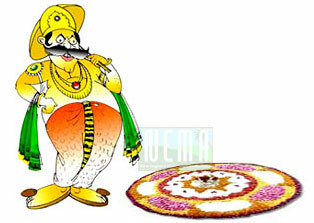 We invite Onam experiences and Onam related thoughts from Malayalees in the New Engalnd region. Please send your entries to pr@nemausa.org. Nikita Shalabh has written about her thoughts on Onam. Nikita is a 5th grade student at Sherwood Middle School, Shrewbury. My dad is from the northern part of India and my mom is from the southern part. My mom’s family celebrates Onam in a big way. Onam is an Indian festival celebrated only in Kerala. They dress up in their best clothes. The women make a design made out of flowers. This is called pookkalam. They make the pookkalam in front of their house at the starting of the celebration. My favorite part of Onam is the food. On Onam you eat on banana leaves. They serve rice, 4 side dishes, varieties of pickle, and papadam. It is a tradition to eat on banana leaves. I didn’t get a chance to celebrate Onam in Kerala so far. I am hoping to do this in the coming year. I interviewed my grandmother about how she celebrated Onam when she was young. She told me how they made henna by themselves. Henna is a color used to decorate hands. They pluck the leaves off the henna plant and then they grind it manually with a stone grinder. Then they mix with water and it becomes a paste. After they are done they put it on their hands and make the most intricate designs. She also told me about kaduvakali. The men dress themselves up as tigers and dance around the street. Her favorite part of Onam is the swing. They make the swing out of ropes and stems of palm trees. And tie it on a branch of a tree. This year Onam is going to be on September 12th, Friday.